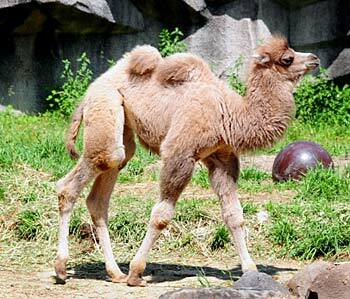 On May 4, the Milwaukee County Zoo welcomed a healthy, 77-pound, female, baby, Bactrian camel. Since her birth, Addi-Jean (A.J. for short), has grown to 220 pounds, and by the time she reaches adulthood, she will weigh somewhere between 1,300 – 2,200 pounds. Zookeepers report she has a very feisty personality – much spunkier than previous baby camels born at the Milwaukee County Zoo. Although A.J. is still nursing from mom, Sanchi, she is sampling adult food consisting of mixed grass hay and pellets. Bactrian camels are native to Asia, specifically China and Mongolia. They have long eyelashes and slit-like nostrils – both serve to protect from the blowing sand. 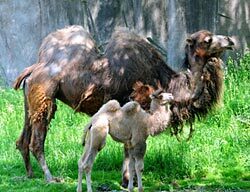 Bactrian camels have two humps, as opposed to Dromedary camels, that have one hump. Contrary to popular belief, the humps do not hold water, but rather, store fat. A.J. can be seen daily in the Camel Yard.